This budget front loader offers a wide variety of cycle options for a less expensive price (roughly $650). It’s quite efficient, using at least 50% less water and 30% less energy than ordinary washers. 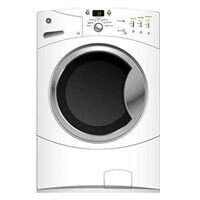 Convenient features include a quick wash, which can clean lightly soiled clothes in less than 20 minutes, and a hand wash setting that can handle delicate items with care. With its king-size capacity you can easily fit large comforters and other bulky items in the drum. There are no steam or sanitizing cycles, but you still receive quality performance and convenient features for a great value.